7PM UPDATE: IT is hard to fathom when faced with footage showing urban waterfalls, whitewater rescue and widespread flooding, but weather boffins believe most of us have had "average rainfall" this summer. The former cyclone Oswald is still brutalising much of the Eastern Seaboard, but the drenching is yet to overshadow the particularly dry December. February, too, is expected to be punctuated with occasional showers from Coffs Harbour to Bowen, but little more. Weatherzone meteorologist Ben McBurney said Central Queensland would be an exception to that, with Mackay, Bowen, Bundaberg and others in the region copping record-breaking downpours. Mr McBurney said overall it was "still relatively dry" compared to the previous two summers. "Rainfall can be quite isolated at times," he said. "It hasn't been a wet summer on average. "If we have another big event, that would be above average. "But we only have a month left (of summer), and it looks like it'll be hotter from February." RAINFALL: Despite being a "relatively dry summer" by some experts reckoning, weekly rain totals might make readers feel differently. UPDATE 5pm: Most rail services in south east Queensland will return to normal from tomorrow. Sunshine Coast services were suspended on Sunday due to flood damage. Translink services to Brisbane city have been ending at outer lying stations, including Bowen Hills and Roma Street, after scaffolding fell on four tracks and overhead lines at Fortitude Valley and caused significant damage. Sunshine Coast commuters were placed have had to use bus services since Sunday. The Queensland Transport Department has confirmed trains from Nambour will recommence tomorrow. All lines from Rosewood through to Ipswich will also reopen. Services between Nambour and Gympie will not recommence until later this week when flooding recedes. Laidley - the clean up has begun: The water has gone from Laidley. Residents and volunteers have put on their gumboots, picked up the hoses and mops to clean out their town. UPDATE 4.30pm: Looters are already taking advantage of flood-ravaged Gympie and Bundaberg. Queensland police commissioner Ian Stewart said there was already at least four cases in evacuation areas and warned there would be more as the water receded. He said extra police had been sent to problem areas to keep property safe from opportunistic criminals. Mr Stewart said such behaviour was disgraceful and disgusting but he urged people not to take matters into their own hands if they caught someone. On the Sunshine Coast, Energex issued a warning about con artists going to homes in the Glasshouse Mountains, posing as Energex workers. They were offering to cut down trees around power lines in return for money. All Energex staff where identification and they do not charge for their services. Premier Campbell Newman, who was in Bundaberg on Tuesday morning, said Queenslanders are already showing "guts and determination" as they begin to recover from the 2013 flood disaster. He urged those who escaped flood damage to pitch in and help their communities get back on track. Mr Newman also urged mayors to use their critical leadership positions to mobilise their areas to begin recovery. "Friends, neighbours, relatives, the person down the street, the little old lady you say hi to on the way to the bus, we've got reach out and help," he said. 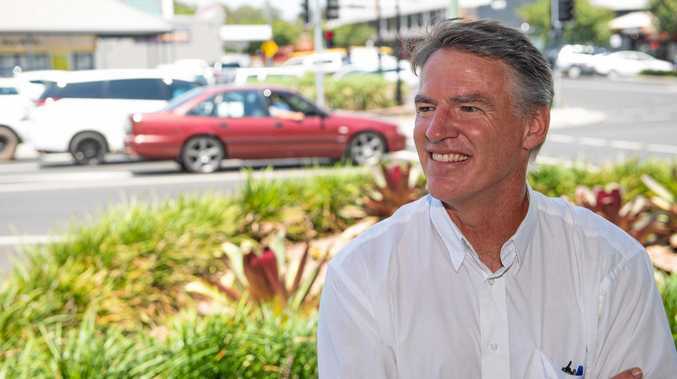 "It's incredible to see the spirit of Queenslanders out on the streets of cities and towns as they grapple with what is a big crisis indeed." MORE than 3000 Queenslanders called RACQ for help during the floods on Tuesday, with the roadside assistance service expecting up to 7000 call-outs for the day. The insurer's team tweeted early on Tuesday morning it was expecting as many as 7000 call-outs across the state in part due to people driving through floodwaters. Across the border, the New South Wales equivalent, NRMA, received more than 1000 call-outs on Tuesday, and was still expecting more late in the afternoon. Police and State Emergency Services in both states have continually called for people not to drive in floodwaters in the past three days. In Gympie, after reaching a height of 20.3m Mary River flood waters are starting to slowly recede and attention has now turned to the major clean-up effort which will roll-out over the coming days. Local Disaster Coordination Centre Chair and Gympie Regional Council Mayor, Cr Ron Dyne, said the flood event had caused inundation to approximately 143 businesses and 25 residences across the region. Mr Newman said the Burnett River at Bundaberg was expected to peak about 2pm at 9.5m which would result in about 2000 homes and 200 businesses being flood affected. He said seeing elderly patients, already going through trauma, waiting in an aircraft hangar "brings home the human face of what is going on in Bundaberg and other centres". Brigadier Greg Bilton, commander of the defence force's flood rescue taskforce, said the first of 131 Bundaberg Hospital patients had arrived in Brisbane after the hospital was expected to have flooding issues. He said they would now be dispatched to various hospitals across the city. Hercules aircraft rescue in Bundaberg : A Hercules C130 at Bundaberg Airport transporting hospital patients to safety. Mr Bilton said they would then begin transporting elderly people whose nursing homes were devastated by flooding. He said four Blackhawk helicopters were still working with other civilian and emergency services aircraft to evacuate people from the North Bundaberg area. Mr Bilton said evacuations continued from isolated pockets in Bundaberg until about midnight on Monday night from but there were more on Tuesday as people who decided to stay needed rescuing. RESIDENTS in the Greater Brisbane area are being urged to conserve water, despite the deluge, because a key water treatment plant is offline. SEQWater said that due to record turbidity levels in the Brisbane River as a result of the extreme weather from ex Tropical Cyclone Oswald, the Mt Crosby Water Treatment Plant was out of action. The bulk water supply demand across the region is currently being met and Seqwater is continuing to work with council distribution retailers to monitor the situation carefully. Due to the shutdown of Mt Crosby, Seqwater and your local water retailer are urging all residents in Brisbane, Logan, Ipswich, Redlands, Moreton Bay, Lockyer, Somerset and Scenic Rim to conserve water over the next 24-48 hours while the bulk water supplies are replenished. Mt Crosby is the region's largest water treatment plant and supplies the majority of Brisbane, Ipswich and Logan city council's drinking water. The turbidity levels in the Brisbane River are four times the level experienced during the January 2011 flood event and are expected to take up to 48 hours to dissipate. While the Mt Crosby Water Treatment Plant is offline, Seqwater is using the Water Grid to move water from a number of different bulk water sources across the region including, the Gold Coast Desalination Plant. Seqwater is also managing the power, communication technology and site access issues at a number of sites across the region. As a result of the large flows entering the region's water sources, a number of those sources are currently experiencing high levels of manganese. Manganese is a naturally occurring mineral and customers may notice discolouration and odour. It can also stain plumbing fixtures and laundry. AS more than 160,000 Queensland households remain without power, the Electrical Trades Union has called for calm understanding for its members who are repairing damaged lines. Most coastal centres from the New South Wales border to Rockhampton remain affected. The union described its workers with the major power providers as "heroes". State secretary Peter Simpson said many inside Ergon and Energex were working 18 hour days from the moment it was safe enough to start repairs. Mr Simpson said some of those members were also volunteering with the State Emergency Service, being put to work beyond their jobs to help their regions. "Like many other state employees in regional and remote communities they go about their work while their families also do their bit," Mr Simpson said. "We had a fantastic example of community spirit, when in Bundaberg, while their partners were out reconnecting power a bunch of our members' wives were answering the call to help billet patients and residents from affected hospitals and retirement homes. "We are bloody proud of the work these men and women are doing, they truly are heroes"
The first of two Royal Australia Air Force transport planes will arrive in Brisbane on Tuesday morning, carrying 41 patients evacuated from Bundaberg Hospital as the town grapples with an unfolding flood crisis. A pair of the RAAF C-130 planes were dispatched from Richmond air force base near Sydney. The evacuation began on Monday night, with 10 critically ill patients and newborns to be delivered to Brisbane Airport at 11am. Teams from Brisbane hospitals will be sent to pick up the patients on arrival. Patients from Bundaberg Hospital are expected to be transferred to Royal Brisbane and Women's Hospital, Princess Alexandra and Price Charles. A second C-130 will arrive in Bundaberg later on Tuesday, delivering another 41 patients to Brisbane when it returns. Up to 60 dialysis patients from Bundaberg will also be transferred to Brisbane, with details still to be worked out. Queensland Chief Health Officer Dr Jeannette Young said those patients will be shared between hospitals in Brisbane and the Sunshine Coast. A much larger transport aircraft is expected to deliver heavy equipment to the flood-hit region of Bundaberg on Tuesday afternoon, which may then be used to spirit more patients from the town. THE fierce weather system from ex tropical cyclone Oswald is moving into New South Wales, as emergency services continue to battle threats along most of the east coast. State Emergency Service volunteers have responded to more than 3000 pleas for help in the past 24 hours, mostly in central Queensland, the north coast, Brisbane and south-east Queensland. Tragically, a three-year-old Brisbane boy became the fourth and youngest victim of Queensland's flood crisis. Swift water rescue teams were called to seven incidents overnight and the SES again today issued a warning that people should not enter floodwaters by road or on foot under any circumstances. An emergency airlift was the only option for 1500 stranded residents in the flood-hit town of Bundaberg to escape fast-flowing waters believed capable of sweeping entire houses away on Monday night. Hundreds of residents in the suburb of North Bundaberg were plucked from their roofs by RACQ Careflight helicopters, AGL Action Rescue Helicopters, and army Black Hawks. The force of the flood - running at an estimated 70km/h - meant residents could not be reached by boat. "The water is everywhere ... it's the worst flood on record," Bundaberg Mayor Mal Forman said. There were more than 2000 homes underwater in Bundaberg - by far the worst-affected city - with thousands of residents bunkered down in schools and at the site of the town's new Agro-Trend showgrounds. Just before midnight on Monday, the Bureau of Meteorology issued another warning for the Bundaberg region, saying there would be further river rises on Tuesday. Major flooding is also occurring at Mundubbera and Gayndah. Major flood levels have peaked in the Burnett River between Abercorn and Gayndah. The peak of 23.0 metres recorded in the Burnett River at Mundubbera during Monday morning was below the 1942 flood level of 23.6 metres. Moderate to major flooding is easing across the Boyne and Auburn Rivers, and in Barkers and Barambah Creeks. The flood peak is now downstream of Paradise Dam. The Burnett River at Walla is currently around 23.0 metres and rising as upstream floodwaters arrive, this is above the December 2010 flood (20.10 metres). Further river rises up to 24.0 metres are possible at Walla on Tuesday. River rises and major flooding are occurring in the Burnett River at Bundaberg. At 10pm Monday, the river level at Bundaberg was at 9.3 metres and currently steady. Further small rises are likely during Tuesday in the Burnett River at Bundaberg. A peak above 9.3 metres is expected late Tuesday or early Wednesday. Walla: Rises up to 24.0 metres on Tuesday. Bundaberg: Further small rises on Tuesday. A peak above 9.3 metres is expected late Tuesday or early Wednesday. In Ipswich, major flood levels recorded a 13.9 metre peak at about 9:30pm Monday. This is below the January 2011 flood peak of 19.4 metres. At 3am Tuesday the river level at Ipswich was 13.25 metres and falling. Relief after Brisbane River peaks: Business owners in Brisbane's CBD breathed a collective sigh of relief when the Brisbane River peaked at a level significantly lower than first feared. Moggill: Peaking below the minor flood level (10.0m) at about 9.5 metres overnight Monday. Jindalee: Peaking near the minor flood level (6.0 metres) early Tuesday morning, about 7.0 metres below the January 2011 flood. Brisbane: Multiple minor flood peaks above 2.0 metres will coincide with the peak of high tides between Monday and, at least until, Thursday, with the most significant of 2.6 metres about 11am Tuesday. In Ipswich, Mayor Paul Pisasale told the ABC, that he was increasingly confident the Bremer River would peak at 14 metres. "If it stops at 14 we're going to be a very happy city, that means the pressures on our city and some of the houses won't be there, there'll only be a few houses that'll be inundated and there'll be a lot of people back in their homes tomorrow." Floodwaters are now expected to inundate up to 3,600 homes and 1,250 businesses in Brisbane, down on original estimates. In New South Wales, where Oswald's impact is now being felt, the SES says more than 7,000 people are cut off by floodwaters. The unofficial river height for the Clarence River is sitting just below 7.8 metres at Prince St, according to flood markers. The Bureau of Meteorology predicts a 7.9 metre peak at about 9am. Residents in Dovedale were last night warned they may have to evacuate. Emergency meetings are likely to be held at 6am this morning. The Grafton levee is about 8.23metres. >> Meanwhile, residents of Burrum Heads say the tornado that ripped through their homes was like a bomb going off. Tornado in Bargara: Amateur vision of the tornado passing through Bargara on Australia Day has emerged. Video: Paullizpuu | YouTube.